Ytterbium (Yb3+)-doped oxyfluoride SiO2-Al2O3-CdF2-PbF2-YF3 glass and nano-glass-ceramic (i.e. glass-ceramics containing nanocrystals) single-index optical fibers were fabricated using two methods: by traditional glass preform drawing and by the crucible technique (‘direct-melt process’). The latter technique permitted the fabrication of perfectly vitreous optical fibers (of about 200 μm diameter), leading subsequently to the fabrication of nano glass-ceramic fibers by a well-controlled heat-treatment process above the glass transition temperature. Structural characterizations have (i) confirmed the vitreous state (absence of crystals) of the glass preforms and the glass fiber obtained from the ‘direct-melt process’ and, (ii) evidenced the formation of Pb 1-x-y-zCdxYyYbzF2 (x + y + z ≈0.3-0.4) fluorite nanocrystals in the final glass-ceramic fibers. In particular, the nanocrystal size was found to be rather homogenous and smaller than 10 nm from TEM measurements for the nano-glass-ceramic fibers produced by controlled crystallization. 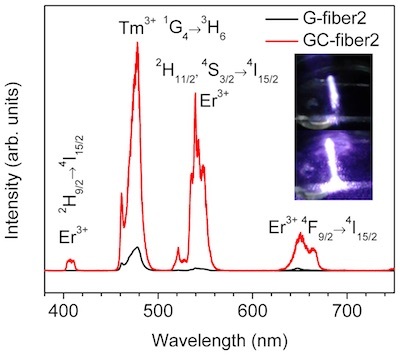 The absolute photoluminescence quantum efficiency, mean fluorescence wavelength and anti-Stokes fluorescence of the Yb 3+-doped fibers were measured upon laser excitation at wavelengths of 940 nm, 975 nm and 1030 nm, respectively. As expected, higher photoluminescence quantum yield in the near infrared (0.95, close to unity) was obtained fo r the nano-glass-ceramic fiber when compared with the glass-fiber. Theoretical calculations were also carried out, showing that optical refrigeration would be achievable from thes e chemically stable and durable nano-glass- ceramic fibers provided that 95% (segregation ratio) of Yb3+ ions are incorporated into the fluorite nanocrystals.